A solar panel is a type of panel that absorbs the Sun ray’s energy and converts it into electricity or heat that you can use. People are investing in this panel because it can save them a lot of money since it only needs the energy from the sun, and nothing else. If you are thinking of getting a solar panel for your home or business here is a rank of the 10 best 100-watt solar panels in 2019. The high-power solar panel from DOKIO is also sleek in size, which is perfect for off-grid application. It is not only good for home installation, but also in RV when you are camping, or beach trips because this monocrystalline panel gives you the efficiency for space that you need. The maximum power is 100W with the dimension of 46.2 inches x 21 inches x 0.984 inches. 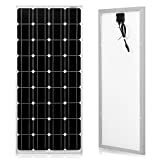 You can rely on this 100-watt solar panel because it is made of monocrystalline solar cells that give space efficiency, and corrosion aluminum resistant frame to allow it to last for decades since it is being used outdoors. With withstand high winds of 2400Pa and snow loads of 5400Pa. In addition, this panel is very easy to install with pre-drilled holes at the back of the panel for fast mounting experience, and security. The 100-watt solar panel from LightCatcher is designed for people who are just new in solar. The starter kit that is great for off-grid installation like trailers, boats, RVs, sheds, and cabins. It provides many benefits to them like power, grid independence, and mobile electricity. The package includes 100W Poly Solar Panel and Pulse 365 PWM with LCD display. The maximum power output of the panel of 105 watts and 100 watts rated output. All the solar cells are made in Germany and ideal for 12-volt battery charging. It comes with a 25-year warranty. You can charge a device using a USB on the solar charge controller, and it can auto-detect your battery type. The 100-watt solar panel from Goal Zero is designed for portability. The Boulder 100 briefcase has a total of 100 watts made from monocrystalline cells in a portable and easy to bring form. The rigid aluminum frame makes it lightweight but tough that makes it an ideal material for camping, off-grid, and emergency situations. Since it is made for portable use, there is no need for charge controllers or extra cables; all you need to do is plug the 100-watt solar panel directly to the Yeti portable power station to collect powers. Although the Yeti portable power station and the combiner cable, if you want to combine it with other solar panels, are sold separately. 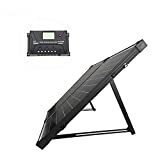 You can assure that this product is durable and weatherproof because it is constructed with tempered glass and lightweight aluminum, and it has a built-in handle, so you can easily bring it wherever you want. This next 100-watt solar panels suits for people who travel like camping, hiking, our going to the beach. 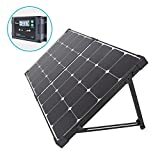 In this type of places, you can rarely see electricity and bringing this portable monocrystalline solar panel from TCXW would be a huge help. Made from high-efficiency solar cells that transform the solar power into energy, that is equipped with 5V/2.1A USB port that charges the devices like mobile phones, laptops, and even electric fans, and DC 18V/5.0A port for the powered devices. You can connect a solar controller with the 55″ MC4 connection cable, although the solar controller is not included in the package. You can now charge your 12V battery, or charge the portable solar generator. The dimension of the panel when opened is 47.6″ x 21.1″ x 0.2″ and it comes with a handle so you can fold it easy, and the dimension when folded of 23.8″ x 21.1″ x 1″ with attached 4 lanyards for easier installation and adjustment to the sunlight. The next solar panel from DOKIO is powerful and lightweight. It only weighs 5.2lbs and with a thickness of 0.2 inches perfect for traveling purposes. It is foldable and protected with a thick fabric bag, so you can carry it easily like going camping, hiking, climbing, picnic, and even battery charging and emergency purposes. You can assure durability since it is a monocrystalline solar cell, and even though it is smaller compared to the other traditional model, it gives a great power efficiency. The solar panel is made from robust, and durable materials, in addition, it is also waterproof and bendable. You can easily install this anywhere, even on your roof. The dimension of the 100 watt solar panel when open is 40″ x 28″ x 0.2″, and 28″ x 20.5″ x 0.4″ when folded. The suitcase 100-watt solar panel from Renogy is efficient, reliable, smart and safe. It has alligator clips for connection, aluminum alloy kickstand, IP65 rated junction box and voyager waterproof 20A charge controller. You can adjust the aluminum stand, handle, and latches to longevity, in addition, the aluminum stand is corrosion-resistant. It includes a battery voltage sensor and temperature sensor so you can monitor it. 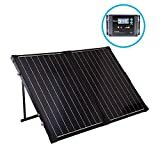 The solar panel is compatible with your RV, trailer, boat, etc. To protect the solar panel, it has a protective casing, and to protect the people surrounds it, it has a low voltage system to avoid hazardous electric shocks. The product’s dimension is 21.5″ x 21.5″ x 3.1″ and weighs 11.7 pounds. It is very easy to carry wherever you go on a trip. The RNG-100D from Renogy are wired in series for 24V and 48V battery charging or grid-tied applications, the diodes that are pre-installed in a junction box and a pair of 31″ cable with MC4 connectors come with a panel automatically. The open circuit voltage is 22.5V, an optimum operating current of 5.29Amps, short circuit current of 5.75 Amps and an ideal output of 500W hours per day depending on the availability of the sunlight. You can mount it on roofs, RVs, and even on the ground. With withstand high wind of 2400Pa and snow loads of 5400Pa, the aluminum can last for decades. It is also compatible with off and on-grid inverters and has a maximum system voltage of 600 volts DC UL. The junction box and MC4 connector are waterproof. It has a drainage hole and a mounting hole. 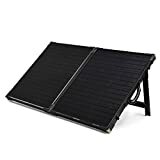 You can install this 100-watt solar panel on a rooftop, yacht, and RVs, and since it is compatible for ground mounting you can bring it to your camping, or glamping. Do not worry about love adventures, because this portable solar panel from Renogy is reliable when it comes to giving electricity when in need. The foldable two 50 watts panel can provide energy to your vehicle and gadgets whenever you need it. The aluminum stand is corrosion resistant and adjustable, the handle and latches are heavy-duty so it can last longer. If you folded it, the size will become 19.9″ x 27.2″ x 2.8″, which is good for traveling purposes since it is easy to carry. The ideal output is 500 watt-hours per day, but it still depends on the availability of the sunlight. It includes a charger controller with the LCD display on it to display the data and operating information. A 20A 5-stage built-in solar charger controller gives protection, and reduce the fire risk. It is compatible with your vehicles like RV, boat, trailer, van, etc. When it comes to durability and flexibility, DOKIO has something to offer. This 100-watt solar panel from DOKIO is water resistant and semi-flexible, which is ideal for crow areas, boats, tight spaces that are mostly off-limits for aluminum and glass models. The bendable panel can gently be flexed so it can follow a smooth curve up to 30 degrees which can be mounted on roofs, cabin, boat, RV, tent or any other areas where you will need it. Since it is bendable, it is also lightweight that it is only 0.1 thick and weighs only 4.85lbs that makes it easier to hang, remove, and transport. When it comes to installation, it is frameless and features four metal reinforced mounting holes for each every corner for screws and installation. The junction box is sealed and waterproof. It has a working voltage of 18V, short circuit current of 5.18A, open circuit voltage of 21.6V, maximum power point current of 5.56A, and optimal power 100W. Our best 100-watt solar panel is from HQST with a plug and play system. You have nothing to complain about since the HQST 20A PWM controller and 10ft. wiring separates your controller and the battery. It is compatible with 24V and 12V system and has an LCD display for easy reading. With the temperature sensor, your charging battery experience is more accurate because it automatically accounts the right temperature compensation. 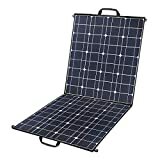 For the solar panel, it is Polycrystalline panels with sturdy aluminum stands perfect for traveling, and easy to carry. The dimension of the panel when folded is 20.0″ x 27.3″ x 3.1″ and 40.0″ x 27.3″ x 1.5″ when unfolded with weighs 21.75 lbs. Renewable Energy Source– We can never run out of solar energy as long as we have the Sun and solar panel gets energy from the Sun that converts into electricity. As long as there is solar energy, you can get a new supply of energy each day. Reduce electricity Bills– Since you can get electricity from the solar panel, your usage of electricity bills will go down, and you can save money and use it in some other way. Low Maintenance Cost– It does not require a lot of maintenance, all you have to do is keep it clean, and a couple of times a year will do. In addition, they have a long-term warranty. Going to places without electricity is hard, and with the help of the 100-watt solar panels, you can recharge your devices and even your vehicles. All these solar panels in our list are high-quality products. 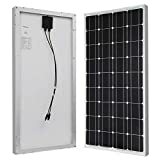 You can expect a long lasting and high-quality service with these panels, which is why they are the best 100-watt solar panels in 2019.